Knob-and-tube wiring is an unsafe and outdated wiring system commonly found in homes built before 1950s. How do I know if I have knob-and-tube wiring? Knob-and-tube wiring has two wires insulated with rubber and has ceramic knob support and tube protection. If your home has any exposed wiring that you can view without touching, check if it matches this description. 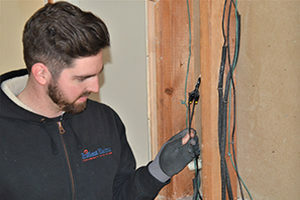 If you see knob-and-tube wiring in your home, have a home built before 1950, or are unsure if you might have this type of wiring in your home, call Brilliant Electric to inspect and rewire your home! Why should I replace my knob-and-tube wiring? 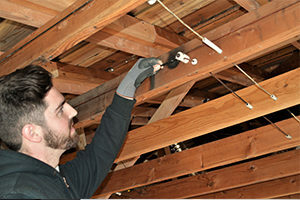 If you are looking to get your home insured, most insurance companies will require you remove and replace knob-and-tube wiring because it is deemed extremely hazardous. In addition to insurance issues, knob-and-tube wiring poses the threat of short circuits, overheating, and fatal accidents like shock and fires. Why is knob-and-tube wiring deemed dangerous? Ground Wire: Modern systems contain a ground wire that protects from serious electrical error, however knob-and-tube wiring lacks the security of a ground wire. Outdated: Knob-and-tube wiring, meant to withstand only 15 amps of electrical current, is often carrying much more than it can handle due to the demands of modern technology. Additionally, these systems use two-prong vessels that restrict use of some technology and appliances.